Yes, things got a little ugly from the bullpen last night — unexpectedly rough performances from Mitch Harris and Seth Maness in particular as the Detroit Tigers ended up beating up on the Cardinals by a final score of 10-4. I will admit I turned the game off in the top of the ninth inning (although that was also because I had to be up very early this morning more than anything). A quick check of social media last night and this morning shows that — as expected — there was great furor from many Cardinals fans over the eight runs allowed once starter Carlos Martinez pitched five innings and allowed two runs. 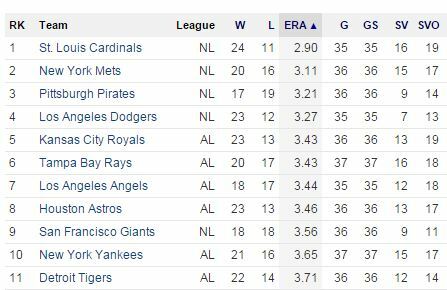 Last night was one game, and the Cardinals still have the best record in the majors. They’ve played 35 games now, with that being only the 11th time they’ve lost. I’ll put my sparkly pom-poms away now and take a look at some numbers instead. 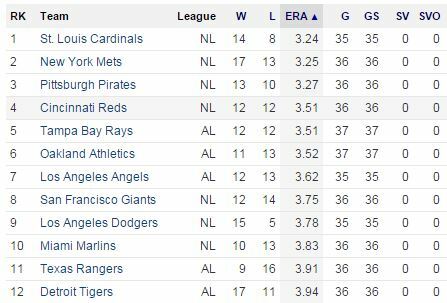 Even with last night, the Cardinals still have the best team ERA in baseball. 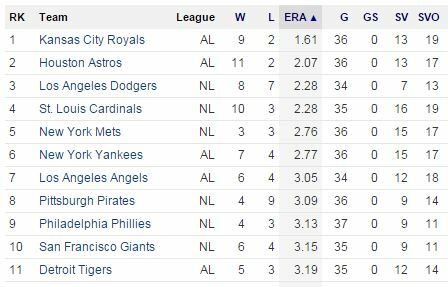 They have the best starter ERA in baseball. And, while yesterday at this time they had the best reliever ERA in baseball at 1.90 or something similar, they didn’t fall that far based on one bad night. Plus, since every day is a new day in baseball, the bullpen disaster can be all forgotten starting at 1:15 p.m. when the Cards and Tigers are back at it again. Sure, a starter match-up of David Price vs. Tyler Lyons might make you cringe a little bit — but that’s why they play the games. This entry was posted in 2015 Cardinals and tagged Bullpen, Mitch Harris, Seth Maness by Christine Coleman. Bookmark the permalink.